My grandmother did genealogy the old fashioned way: she wrote letters. Before the internet existed, she wrote to state archives and court houses. She corresponded with relatives and exchanged information. She was also a saver, and when she died in 2001, I inherited a collection of newspaper clippings and funeral programs (more than 25). This week I decided to scan all of it! 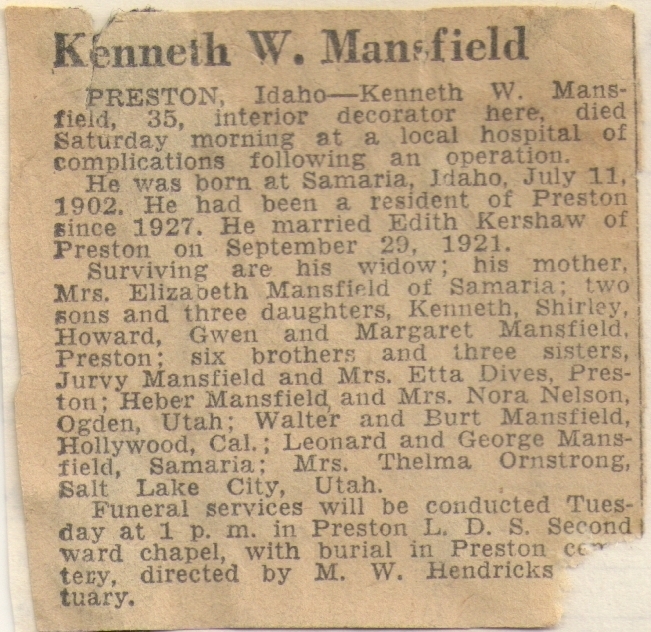 Great Uncle Kenneth was three siblings older than my grandma. My grandma saved these clippings, announcements, and programs for sentimental reasons but also to add documentation to her genealogy charts. She would probably love the obituary indexing movement that is sweeping the country, currently. Thousands of volunteers working for sites like FamilySearch.org, Ancestry.com, and GenealogyBank.com make it possible for new obituaries to be added to online databases weekly. You can read about the latest additions to Family Search, here. Great Uncle Walter was four siblings older than my Grandma Thelma. Today, I wanted to share some advice about how to use obituaries in your research. Obituaries are not a primary source of death information. They are secondary, at best. 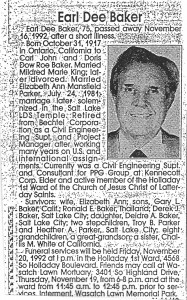 In fact, of the hundreds of obits I have indexed for FamilySearch, very few of them actually had the death date written within the text of the article. Usually, they read “So-and-so died at home, Tuesday.” If the date on the paper is still attached, you do a little math and hope you come up with the correct date. More importantly, newspaper staff do not check facts or spelling on obituaries unless the deceased is famous or important to the town’s history. Also, keep in mind who actually wrote the obituary; usually a bereft family member going by memory. So, how should we use obituaries? We should follow the leads they provide to fuel our research. The names of surviving children and grandchildren help us to document the extended family. Married names of female relatives expand our knowledge of maternal lines. Place names of where the deceased lived and birth and marriage dates all need to be verified via other sources, but because this information is often included in the obituary, you have a starting point from where to look. Sometimes my grandmother collected more than one obituary per person. These were clipped from papers in different towns and states. Amazingly, the information was never identical. The obits were probably submitted by different people who knew different things about their loved one. The mistakes are numerous and inevitable. Names are misspelled, survivors are left out, careers are truncated, nicknames replace whole names. So, don’t record the information from an obituary permanently into your personal files without verifying the details with another source, such as a death certificate or Social Security Death Index record. Newspaper obituaries can provide leads about an ancestor in areas you knew nothing about. Did you know your great uncle served in the military? Maybe your great-grandmother had a mystery first-marriage? The best obituaries list human interest details like school names, club affiliations, and hobbies. These details can help you tell the more complete story of your relative’s life. When I was researching my great-grandfather Brigham Mansfield’s 1903 church mission to Great Britain, I came across another man’s journal from some 15 years later that mentioned a missionary with the same surname as my gr-grandpa. Could it be that his son served in the same mission? When I read Heber Mansfield’s obituary, it mentioned his mission to England (see above). Confirmation. I love when that happens! Kingman, Ariz. – Price Armstrong, 65, Kingman, died of natural causes March 17, 1974, at home. Born Dec. 15, 1908, in Virginia to Walter Shelton and Virginia Lee Blanton Armstrong. Married Julia Young; divorced. Married Kate Sudbury Evans, 1959, Reno, Nev. Retired foreman, Ringsby Truck Line. 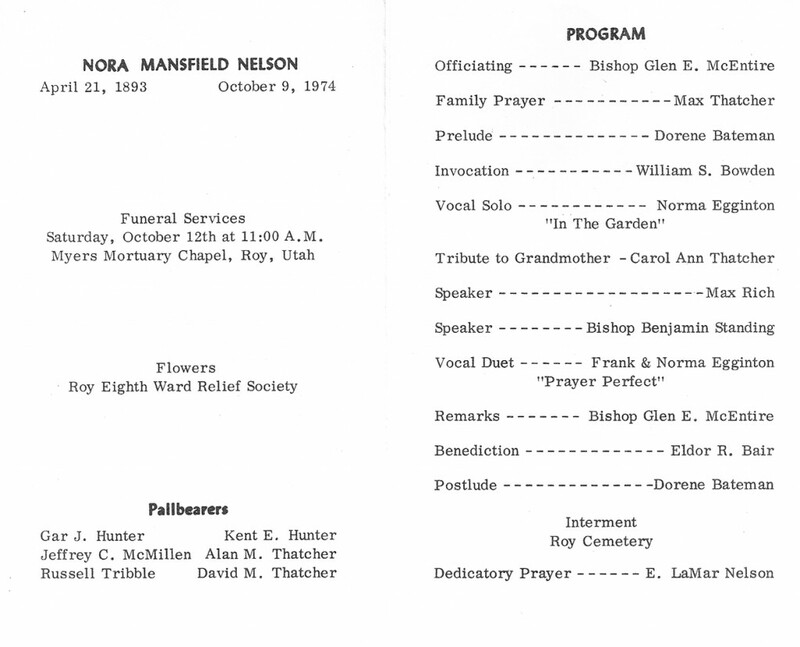 Survivors: sons, daughter, Dean, Maryland; LaMayne, Mrs. Bar Dee Gillis, both California; 13 grandchildren; stepdaughters, Mrs. Nancy Livingston, Mrs. Frances Cundick, both Salt Lake City; sister, Mrs. Nelda Cook, Salt Lake City; brothers, Marvin, Bob, both California; Lynn, Portland, Ore. Funeral Saturday noon, Deseret Mortuary, 36 E. 7th South, where friends call Friday 6-8 p.m., Saturday prior to services. Burial at Redwood Memorial Estates. First of all, both articles misspelled my mother’s brother’s name, but they managed to misspell it differently each time. That tells me that whoever submitted these was not familiar with my side of Grandpa Price’s family. 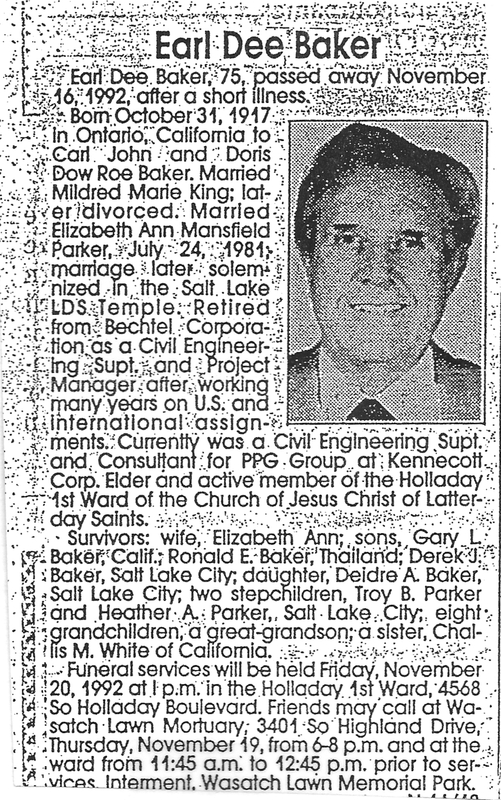 The Utah article mentions a first wife, Julia, with whom he had a son, Dean. That’s fine. Both articles mention a widow, Katie, with different spellings for her last name (and with whom no marriage certificate exists, by the way). OK. But, interestingly, both articles completely erased his 28-year marriage to my grandmother. Twenty-eight years! Gone! I guess my mom and uncle were delivered by stork! And thus we see why it is not a good idea to record everything you read in an obituary as fact. 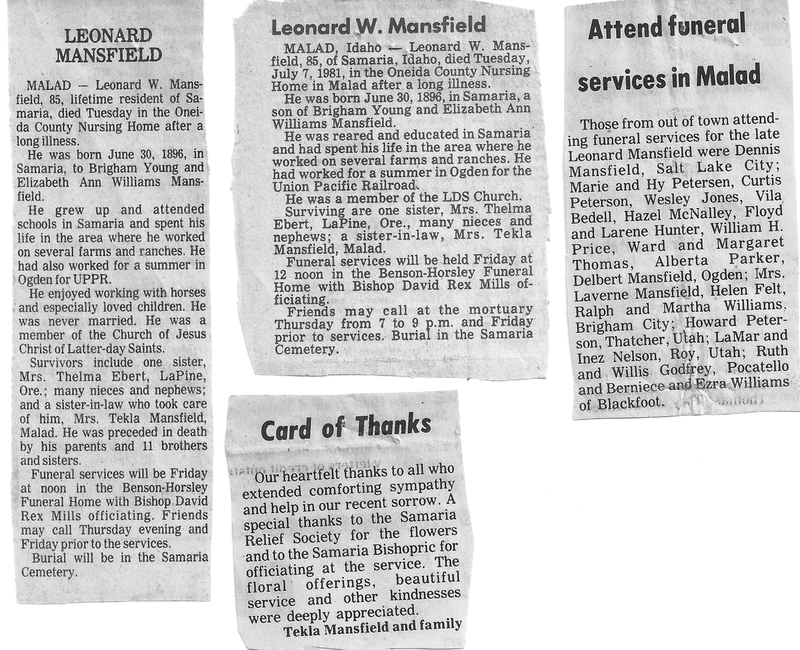 When I was scanning my Grandma’s papers, I came across a collection of clippings all about her brother Leonard. I thought it was so sweet that she saved every word that was printed about him and that this small town paper printed so much. A severe childhood illness effected Uncle Leonard for the rest of his life. He lived simply and close to home. I have tried to imagine what it was like for my grandma, the 12th of 13 children, to be the last surviving child in her family, and how she felt as she attended and saved the clippings and programs from each of her siblings’ funerals. Maybe these obituaries tell me more about her than they do about them. There are other online sources for digitized newspaper information. Here is an article about how to explore your ancestors’ lives through online newspaper research. I listen to a wonderful podcast called Extreme Genes. Episode 9 features a great interview all about digitized newspaper research. Listen to that, here. The Library of Congress has a massive index of digitized newspapers. Find out which states and which papers and editions have been included in this project, so far, by scrolling down the Chronicling America website. Many public libraries and county archives have an obituary-saving program as well as indices for local historic cemeteries. Check with your favorite librarian to see if your branch has these resources. The New York Public Library has some terrific advice for using obituaries in your research, here. One neat thing about finding your ancestor’s newspaper obituary is that you just might find a picture to go with it. My grandma has pictures of all of her siblings when they were younger, but because she saved so many news clippings, I also know what many of my great aunts and uncles looked like toward the end of their lives. I’m kind of glad my grandma did things the old fashioned way. Happy 150th blog post to me! This entry was posted in Genealogy and tagged digitized newspaper, genealogy, indexing, Mansfield, obituaries, research, Williams. Bookmark the permalink. Hi there! I’m part of the Mansfield family (Heber C. Mansfield was my great-grandfather) and I’m interested in learning more about his / his father’s missions to England. Do you have any info you’d be able to share? The Church History Library has a photo copy of a photo copy of Brigham’s journal. I have given them permission to digitize it since I own the original. You should check their online catalog to see if that has been done. Otherwise, you will have to go to SLC to read it. I learned more about his mission by reading other journals of his contemporaries (housed at the CHL or BYU Special Collections Library). That is also how I learned about Heber’s mission, as I don’t believe he kept a journal. However, he does show up in a few entries of the journals of others. Try http://archives.roueche.org/?p=3411 or http://archives.roueche.org/?p=3037 for more info. Also, type Mansfield or Williams into the search box on my blog or use the tag field at the bottom.